We tested a stack of USB-C charging laptops and surprise: They finally work! (Mostly). USB-C ports were supposed to bring universal charging, but the last time PCWorld dove into it, the results were pretty dismal. Google’s second-generation Chromebook Pixel and Apple’s original 12-inch MacBook had no issues working with each others’ chargers, but HP, Dell, and Razer all gave us fits. We might as well have been back in the dark ages when cell phones used proprietary chargers, before someone decided to adopt mini-USB and we never looked back. Just a little over a year later, we decided revisit our plug-fest with as many laptop brands as we could get. The laptops we tested were manufactured by the same makers responsible for selling about 80 percent of the world’s notebook PCs. 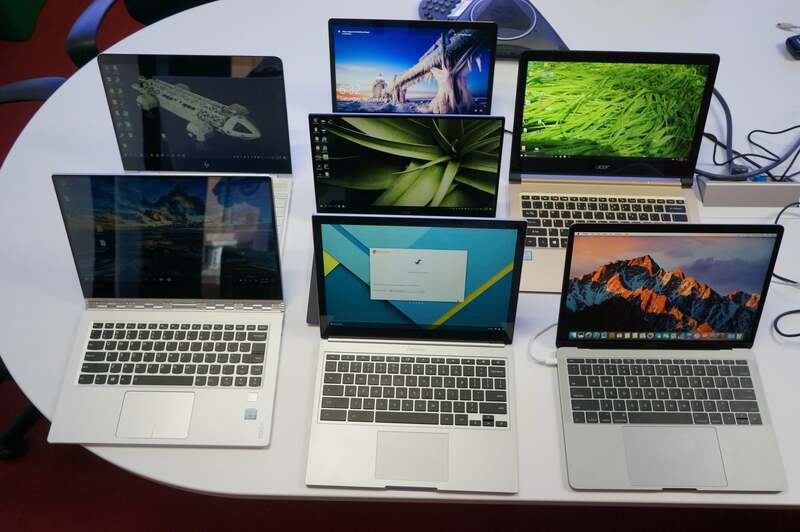 The models you see above are from Acer, Apple, Asus, Dell, HP, and Lenovo, vendors that represent about 80 percent of the laptops sold every year. To this, I added the second-generation Google Chromebook Pixel laptop. 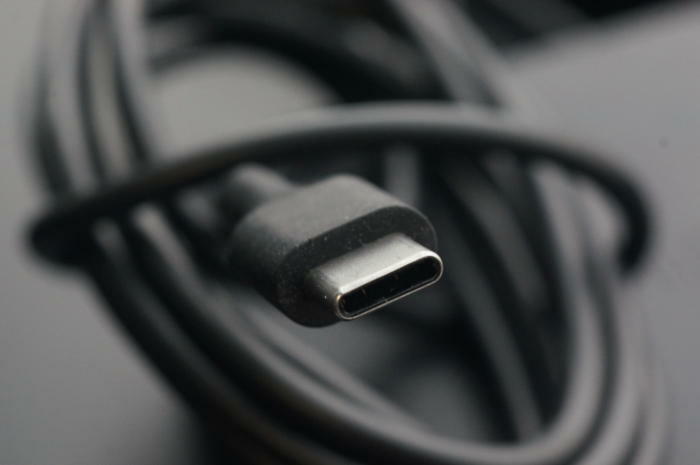 Although its numbers sold are small, the Pixel has been the role model for how to do USB-C charging right. Finally, I added a Huawei Nexus 6P smartphone to see if the laptops’ chargers would work with a different species. Unlike the Dell Skylake version of the XPS 13, which still ships with a proprietary barrel charger despite supporting USB-C charging, all of the laptops you see come from the factory with USB-C chargers. To the pile of bricks, I also added Innergie’s PowerGear 45 USB-C charger, which was used in the original 2015 plugfest. I unfortunately didn’t have the Razer and HP laptops from the original test, as they’d long ago been returned to the manufacturers. We tried this rat’s nest of USB Type C chargers on different brands of laptops to see how interoperable they were. For this test, the laptops were powered on with their screens set to 100-percent brightness. I didn’t put stress on the CPUs, which would increase the load on the charging circuits. To measure what the charge rate was on each laptop, I used a Satechi USB Type C Power Meter (available on Amazon.com) and recorded the voltage and amperage each laptop consumed while being charged. I also checked what the OS on each laptop was reporting. On laptops that had issues, I removed the power meter from the loop and retested without it, to ensure the meter wasn’t introducing an issue in the charging circuit. For the record, this made no difference with any of the laptops. We used a Satechi USB Type C Power Meter that shows how much voltage and amperage each laptop is drawing while charging. On problematic chargers and laptops, we removed the power meter to verify it wasn’t an issue. I’ve long joked that standards are what the industry uses so manufacturers have a uniform way to do everything differently. In 2015, it certainly felt that way, as only the PC makers were the ones that couldn’t get USB-C right. Here’s the result from that test below. Our original USB-C plugfest resulted in tears with most of the PC OEMs giving us much heartache. The good news is we’ve come a long way. Out of eight devices, only the Lenovo Yoga 910’s charger gave me consistent grief. 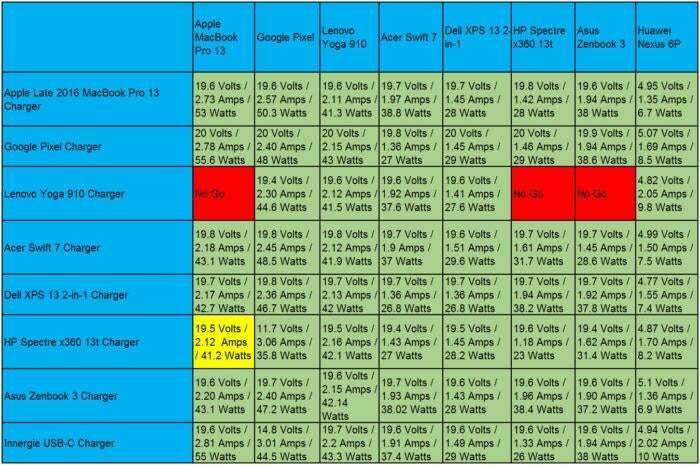 Apple’s new MacBook Pro 13, as well as HP’s Spectre x360 13t and the Asus Zenbook 3, refused to recognize the Lenovo Yoga 910 charger. Is this the fault of the Apple, HP, and Asus or or is it the fault of the Lenovo Yoga 910 charger? 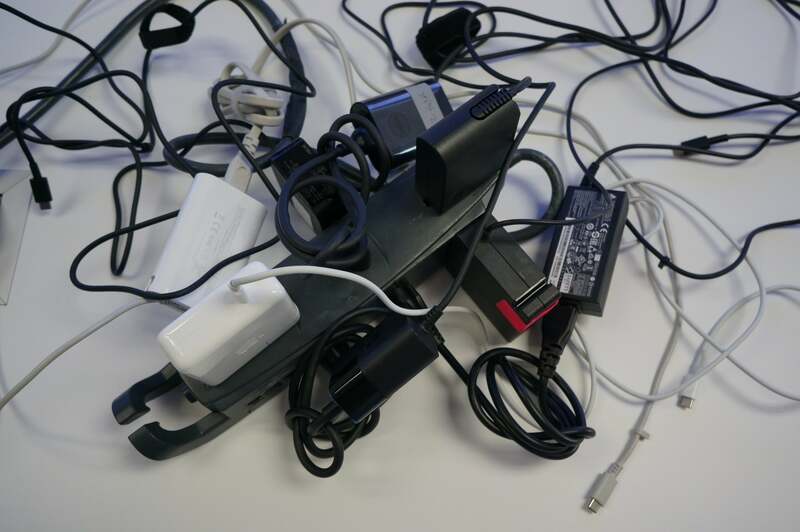 That’s difficult to say, but those laptops have no issues with the seven other chargers used, including the third-party Innergie, so the guilt certainly seems to lie with the Lenovo charger. Interestingly, the Yoga 910 itself was able to charge on all eight different bricks. The only other charger that gave me occasional hiccups was the one that came with the HP Spectre x360 13t. The Apple MacBook Pro 13 failed to recognize it most of the time. 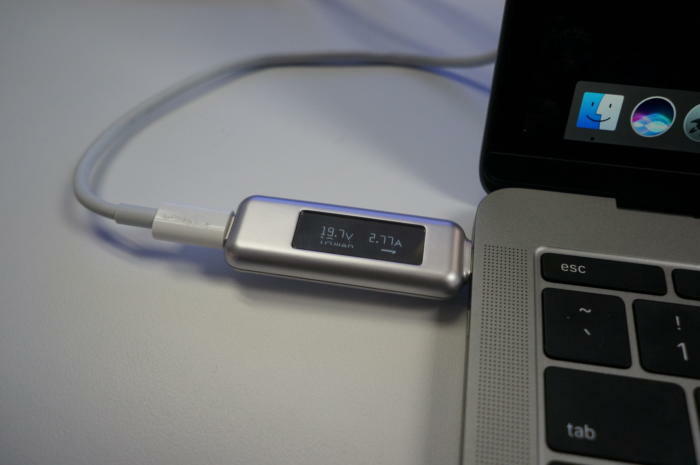 The second good news to report is that, according to our USB-C meter, charge rates were high enough that you could use your laptop and charge it at the same time. Last year, the only thing I could report was charge or not-charge, plus an estimated time to complete a charge. With the power meter, we can see exactly how much power is being consumed, and for the most part it’s enough. The MacBook Pro 13, which comes standard with a 61-watt power brick, accepted power at a reasonable rate from the other chargers, which were mostly 45-watt bricks. I suspect, however, that if you pushed the MacBook Pro 13’s CPU or GPU with the screen maxed out and the SSD going, you’d overwhelm the 45- watt power bricks, and the laptop would start to drain from the battery. Nevertheless, it’s great that you can use just about any PC charger. Universal USB-C charging is pretty much a reality today, finally. Although we had some bad luck with the Lenovo power brick, I’m comfortable declaring that universal laptop charging has finally arrived. Forget your power brick at home? Just borrow a friend’s or buy one at the local electronics store. Naturally, this doesn’t apply if you don’t have a laptop with USB-C charging. Today, it’s limited mostly to higher-end laptops—all of the laptops we tested are priced north of $1,000—but that’s going to change soon enough. 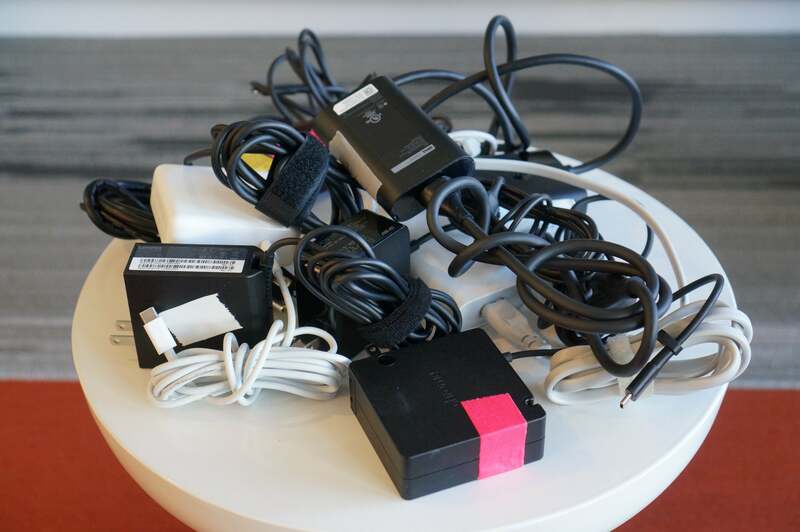 We took eight USB-C laptop chargers to see if they could charge other maker’s laptops or not.